This is probably the most significant new product line in our store ever! After an absence of 10 years in Canada, Parasound is BACK in Canada. For more than a couple of years now, Pat has been badgering Parasound to bring their products back to Canada and has been instrumental in getting Parasound back to our market. Why is Pat so excited? The Parasound HALO JC1 Mono Block Reference Power Amplifier by John Curl is truly one of the very best power amplifiers you can obtain on the market with all the best quality parts. The Parasound HALO Reference JC1 Mono Block is designed by John Curl, the person who designed the first High-End Mark Levinson JC preamps which Pat sold in 1974. Since then, John Curl with Walter Jung, had built up a tremendous data base on what and how each manufacturers’ electronic component sounds like. Every by-pass caps to resistors to power supply capacitors, the widest spectrum of electronic components were carefully listened to and tested. These hand-picked components is what is found inside the Parasound HALO JC1 Mono Block Reference Power Amplifiers by John Curl. For instance, you will find Ultra-high Bias Class A/AB operation (25 watts in Class A 20-20K Hz @8 ohms and 1200 watts RMS at 1.2 ohm). The circuit design is Direct Coupled with no capacitors or inductors in the signal path. Only the best complementary MOSFET driver stage and JFET on the input stage are used. There are 18 Beta-Matched 15 Amp 60 MHZ Bipolar Output devices in each of these amplifiers. There is a 1.9kVA encapsulated toroid power transformer powering 132,000 uF Nichicon Gold Tune Filter Capacitors for the output stage, and 18,000 uF High Speed Filter Capacitor for the driver stage, all separately and independently regulated. The impressive parts list continues on with REL and Nichicon Muse Capacitors and Harris Hyper-Fast Soft Recovery Diodes for all bridge Rectifiers. The Aluminum chassis rear panel has Vampire Brand 24K gold RCA jack, Neutrik Brand premium XLR connector, etc. This is one Reference power amplifier that the DIY audiophiles will not be able to modify to be better sounding, why? Because John Curl wrote the book on parts selection, circuit layout, power supply designs in ultra-High-End Audiophiles electronics. I have not found an equal even at $250,000, and yet this Parasound HALO JC1 Mono Block Reference Power Amplifiers by John Curl only sells for $6300. 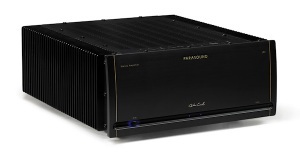 There is also a Parasound HALO JC5 Stereo Power Amplifier that puts out 400 Watts RMS @ 8 ohms x 2 for $8500. Wow, talk about High End Audio Value, this Mono Block Power amplifier will surely go down in history as the STEAL of the century for High End Audio. Hurry, before this preamp goes up in price. Shipping weight: 80 lbs. each Mono Block. Price: $6,300.00 each Mono Block.